Muhcine Ennou is a self-taught Moroccan artist, currently living in the Netherlands. Due to his motivation for a broad range of interests, Ennou taught himself photography, design, and developed interests in sound and architecture, leading to a hybrid practice in which these medias feature in interdisciplinary cross-overs. His work process often results in the combination of analog and digital techniques, both in visual and sonic art, leading to exciting fusions of organic textures with electronic elements. 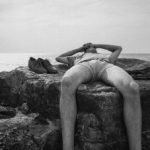 The works he exhibits at SEA Foundation revolves exclusively around photography, through which he explores the socio-cultural nuances of the daily life. Muhcine Ennou’s fascination for photography started off as an act of pragmatism. As a child, Muhcine used to dislike being photographed in the mandatory family photos, so in order to escape from this, he took it upon himself to take the family photos instead. Years later while he was obsessed with design and architecture, his uncle gave him a camera to pass the time. This turned out to be a pivotal point in his career, since this led to his habit of taking a camera with him at all times, which gradually caused him adopting photography as his medium of choice for artistic expression. “Photography actually used to be a getaway from life and everything around me. I was taking photos during my lunch time when I was working as graphic designer, yet every day my appetite to take photos grew larger. I became fascinated with photography. To me, photos are a multifarious combination of what any human can see, suffused concurrently with all the negative and positive spices of life, stories told in brief moments”. In his photographic work, Muhcine Ennou seeks to explore the subtleties of everyday life in his home country Morocco. His interest in sociology and ethnography play a key part in his artistic practice of capturing these socio-cultural nuances. Muhcine is fascinated by the fact that cultural meaning remains open-ended and polysemous. Traveling to and participating in different cultures is therefore a crucial activity, since this allows him to construct his frame of reference for interpretation: “It’s the mixture of what I see, feel and do in my everyday life that makes me reflect on things. Things that I do not understand, things that make me feel a certain way, or things that make me ask more questions”. The act of looking is never neutral since the gaze is always influenced by the discursive disposition of the onlooker. Gazing is, therefore, a performance that orders, shapes and classifies. Without this disposition, you are unable to follow the tacit conventions of a particular discourse. You are not introduced to these conventions, but rather you fall into them and eventually repeat them. They are governed by social rules; a “script” which is already there even though it is not always explicit. Taking a picture is the result of being a part of something, in order to attune himself to what Muhcine Ennou calls “the sweet and sour spices of everyday life”. By participating in a specific cultural context, his photographs capture an embodied sociological narrative, a reaction to a somatic experience of a lived moment. For this reason, Muhcine Ennou moves in and out different socio-cultural discourses. His photographs from the series Melting Pot are the result of a project which took him several years to complete. By traveling around and going back, he experimented by living differently, yet at the same time retaining enough of a distance due to the constant juxtapositions of different cultures, in order to acquire the necessary frame of reference to get closer to an understanding of a society. 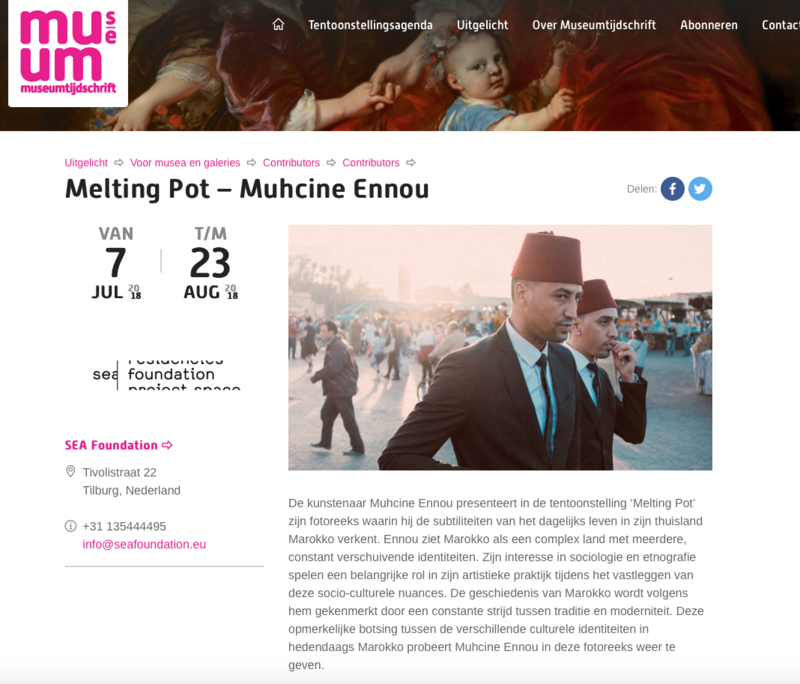 Melting Pot was a special project because it was partially the result of random photos that he took over the course of his stay in Morocco. As he describes it, one day he was looking through the photos and he saw the depiction of an identity and cultural clash. He made a selection from over thousands of images to clarify these patterns, which were translated into a documentary project later on, incorporating everything that he had in mind. These peculiar clashes between different cultural discourses, is what Muhcine Ennou tries to display in this series of photographs. Above all, Melting Pot creates a feeling of liminality. His streetscapes show a proliferation of dressing styles which mixes both older but also contemporary fashion genres through eclecticism. 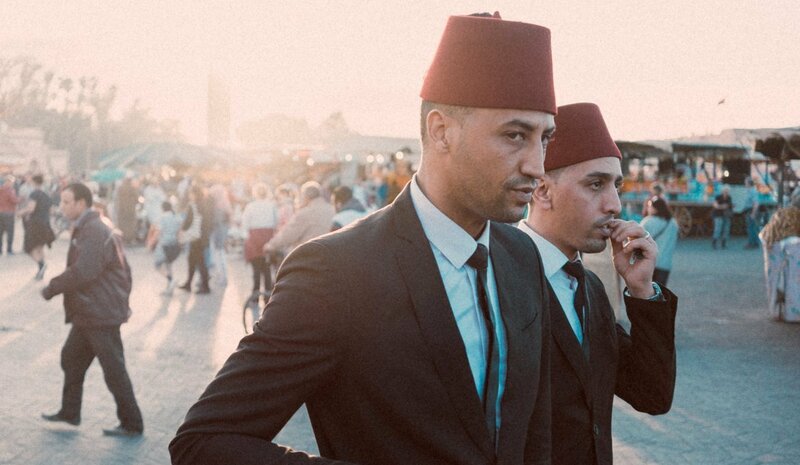 We see the adoption of meaning through the appropriation of material objects from different cultures; both various Moroccan sub-cultural influences are present yet influences from the Western world can also be discerned. We see mix-ups of various tacit conventions, resulting in performances which contain traces of both tradition and modernity, not quite harmoniously synthesized yet simultaneously coexisting nonetheless. This mixture of old and new, domestic and foreign, creates a feeling of a convoluted melting pot, consisting of a myriad of socio-cultural relationships.